The explosion of Earth Observation (EO) data has driven the need to find innovative ways for using that data. We sat down with Grega Milcinski from Sinergise to discuss Sentinel-2. During its six month pre-operational phase, Sentintel-2 has already produced more than 200 TB of data, more than 250 trillion pixels, yet the major part of this data is never used at all, probably up to 90 percent. What is a Sentinel Hub? The Sentinel-2 data set acquires images of whole landmass of Earth every 5-10 days (soon-to-be twice as often) with a 10-meter resolution and multi-spectral data, all available for free. This opens the doors for completely new ways of remote sensing processes. We decided to tackle the technical challenge of processing EO data our way – to create web services, which make it possible for everyone to get data in their favorite GIS applications using standard WMS and WCS services. We call this the Sentinel Hub. In addition to research grants, which made it easier to start this process, there were three important benefits from working with AWS: public data sets for managing data, auto scaling features for our services, and advanced AWS services, especially AWS Lambda. 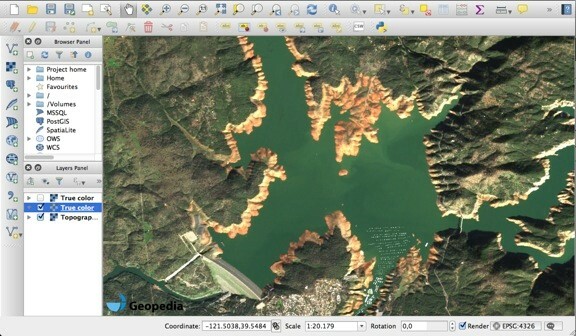 AWS’s public data sets, such as Landsat and Sentinel are wonderful. Having all data, on a global scale, available in a structured way, easily accessible in Amazon Simple Storage Service (Amazon S3), removes a major hurdle (and risk) when developing a new application. Why did you decide to set up a Sentinel public data set? We were frustrated with how Sentinel data was distributed for mass use. We then came across the Landsat archive on AWS. After contacting Amazon about similar options for Sentinel, we were provided a research grant to establish the Sentinel public data set. It was a worthwhile investment because we can now access the data in an efficient way. And as others are able to do the same, it will hopefully benefit the EO ecosystem overall. How did you approach setting up Sentinel Hub service? It is not feasible to process the entire archive of imagery on a daily basis, so we tried a different approach. We wanted to be able to process the data in real-time, once a request comes. When a user asks for imagery at some location, we query the meta-data to see what is available, set criteria, download the required data from S3, decompress it, re-project, create a final product, and deliver it to the user within seconds. You mentioned Lambda. How do you make use of it? It is impossible to predict what somebody will ask for and be ready for it in advance. But once a request happens, we want the system to perform all steps in the shortest time possible. Lambda can help as it makes it possible to empower a large number of processes simultaneously. We also use it to ingest the data and process hundreds of products. In addition to Lambda, we have leveraged AWS’s auto scaling features to seamlessly scale our rendering services. This greatly reduces running costs in off-peak periods and also provides a good user experience when the loads are increased. Having a powerful, yet cost-efficient, infrastructure in place allows us to focus on developing new features. Can you estimate cost benefits of this process? We make use of the freely available data within Amazon public data sets, which directly saves us money. And by orchestrating software and AWS infrastructure, we are able to process in real-time so we do not have any storage costs. We estimate that we are able to save more than hundreds of thousands of dollars annually. How can the Sentinel Hub service be used? 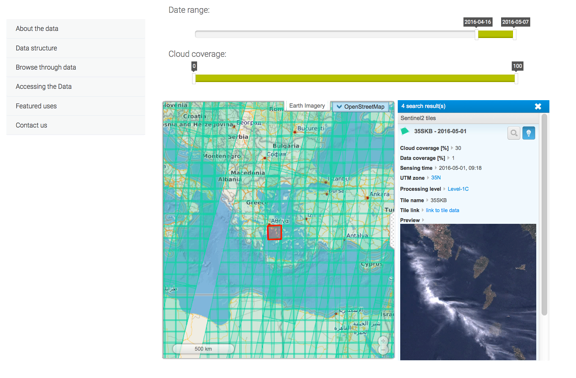 Anyone can now easily get Sentinel-2 data in their GIS application. You simply need the URL address of our WMS service, configure what is interesting, and then the data is there without any hassle, extra downloading, time consuming processing, reprocessing, and compositing. However, the real power of EO comes when it is integrated in web applications, providing a wider context. As there are many open-source GIS tools available, anybody can build these added value services. To demonstrate the case, we have built a simple application, called Sentinel Monitoring, where one can observe the changes in the land all across the globe. Figure 5 – NDVI image of the Alberta wildfires, showing the burned area on 2nd of May. By changing the date, it is possible to see how the fires spread throughout the area. What uses of Sentinel-2 on AWS do you expect others to build? There are lots of possible use cases for EO data from Sentinel-2 imagery. The most obvious example is a vegetation-monitoring map for farmers. By identifying new construction, you can get useful input for property taxation purposes, especially in developing countries, where this information is scarce. The options are numerous and the investment needed to build these applications has never been smaller – the data is free and easily accessible on AWS. One can simply integrate one of the services in the system and the results are there. 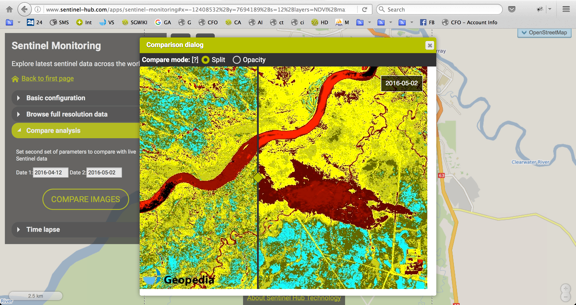 Get access and learn more about Sentinel-2 services here. And visit www.aws.amazon.com/opendata to learn more about public data sets provided by AWS.